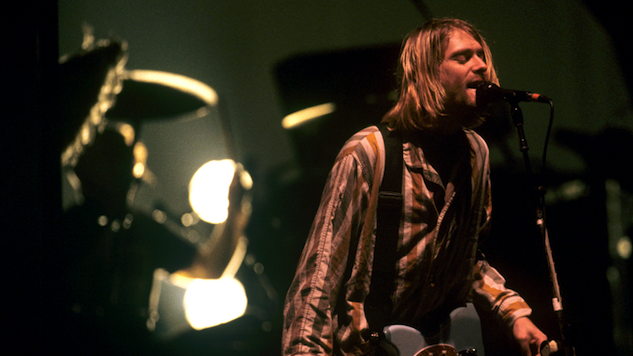 Despite Nirvana’s premature demise, the band managed to amass an impressive fanbase, and Kurt Cobain became an icon for a generation who identified with his struggles and addiction. When he died, he left behind a wife and daughter, as well as a variety of possessions, which will be put up for auction on Julien’s Live auctions in the “Icons And Idols – Rock ‘N’ Roll” lot next month. Included will be numerous items related to Nirvana, such as the band’s MTV Video Music Award for “Smells Like Teen Spirit” (which started at $12,500), show flyers, and various tour and television appearance ephemera, as well as personal belongings, like various handwritten letters and even Cobain’s Blockbuster video card, which has a starting bid of $100. The membership card, issued by the Blockbuster at 1508 North Orange Grove in Los Angeles, was found in a plastic wallet insert also containing two scraps of paper, printed with the names and addresses of John Silva at Gold Mountain Entertainment (Nirvana’s management company), and one printed with the name and address of Lee Johnson at Voldal-Wartelle Accounting (Nirvana’s accounting firm). The auction kicks off on Nov. 4. You can check out the rest of the lot here.